Ananya Dance Theatre announces the second installment of a multi-year series of full-length dances exploring the kinds of work that women around the world do to sustain their communities. This second piece is funded in part by The John S. and James L. Knight Foundation, as part of its Knight Arts Challenge, a community-wide contest funding ideas that engage and enrich Saint Paul through the arts. Titled ROKTIM, it will premiere at The O’Shaughnessy on the campus of St. Catherine University in Saint Paul in September 2015. To tell the story of women’s roles in the global food system, choreographer Ananya Chatterjea, visual artist Seitu Jones, and behavioral artist Marcus Young will partner with Frogtown Farm, Afro Eco, and the Indigenous Peoples Task Force to reflect and honor the age-old work of women who cultivate, nurture and protect land and agriculture. The work will employ contemporary Indian dance to weave together artistic process and social justice in telling the stories of those whose often-unacknowledged labor sustains communities. Roktim will include an original sound-and-music score by Greg Schutte, Chatterjea’s longtime collaborator. Young helped direct Ananya Dance Theatre’s two most recent productions, Neel: Blutopias of Radical Dreaming (2014) and Mohona: Estuaries of Desire (2013). Chatterjea recently collaborated with Jones on Create: The Community Meal, a multi-media public artwork that included an outdoor civic dinner served to 2,000 people on a half-mile long table. Earlier, Jones designed the sets for Duurbaar: Journeys Into Horizon in 2006. “The arts are an important way to examine the stories and histories that shape our society. 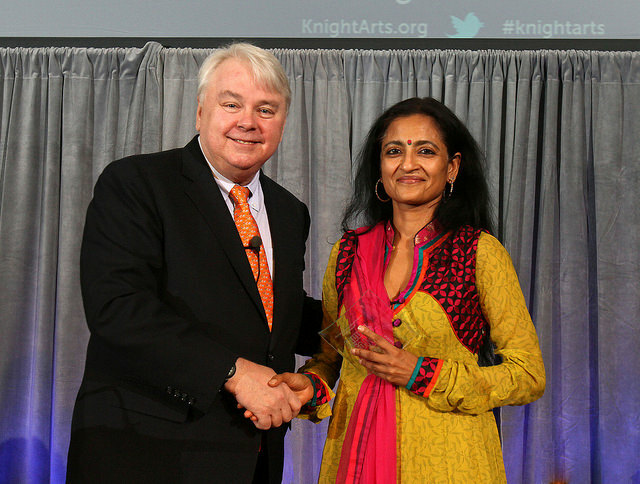 We expect that Ananya’s production, which involves some of the city’s leading artists, will provide an important lens for exploring this issue,” said Dennis Scholl, vice president of arts for Knight Foundation.